“Aunt Sammy” had a radio show that began in 1926; it was a production of the US Department of Agriculture’s Bureau of Home Economics. No, I’m not kidding – the agency existed under that name from 1923 to 1942, when its name changed to Bureau of Human Nutrition and Home Economics (under which it continued until its abolition in 1953) (thank you, National Archives). This 1931 edition of the Bureau’s recipes, entitled “Aunt Sammy’s Radio Recipes Revised,” was compiled by Ruth Van Deman (Associate Specialist in Charge of Information) and Fanny Walker Yeatman (Junior Specialist in Foods), and was published by the Government Printing Office (price: 15 cents). 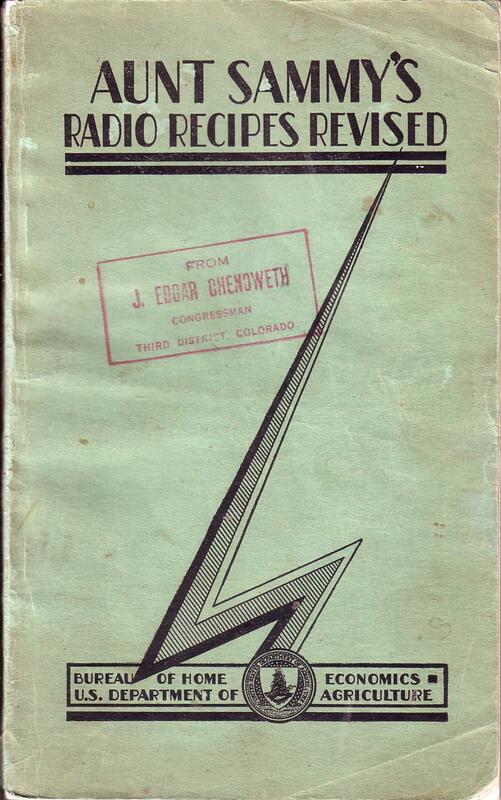 As the stamp on the cover indicates, this one was given out by a Colorado Congressman. Soak the gelatin in the cold water for 5 minutes, add the boiling water and sugar, and stir until dissolved. Add the lemon and orange juice and pulp, chill until partially set, and beat until foamy. Beat the whites of the eggs with the salt until stiff and fold into the gelatin mixture. Then fold in the whipped cream, pour into a wet mold, and put in a cold place until firm. Turn out onto a platter, and garnish with orange sections if desired. Today’s second item brings us back to chocolate again. Yum! 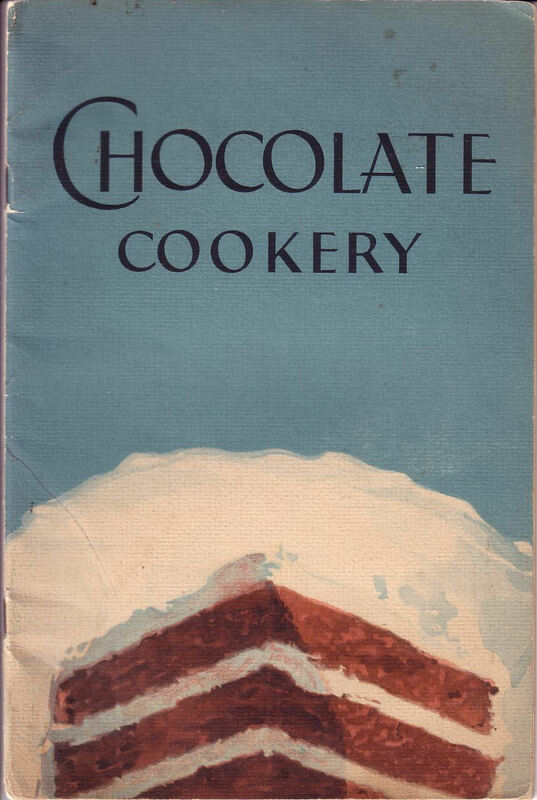 “Chocolate Cookery” was published in 1929 by the the Educational Department of the Walter Baker Division of the General Foods Corporation, who really could have used a better graphic artist for the cover. The booklet that a previous iteration of the company published back in 1916 was much more attractive. 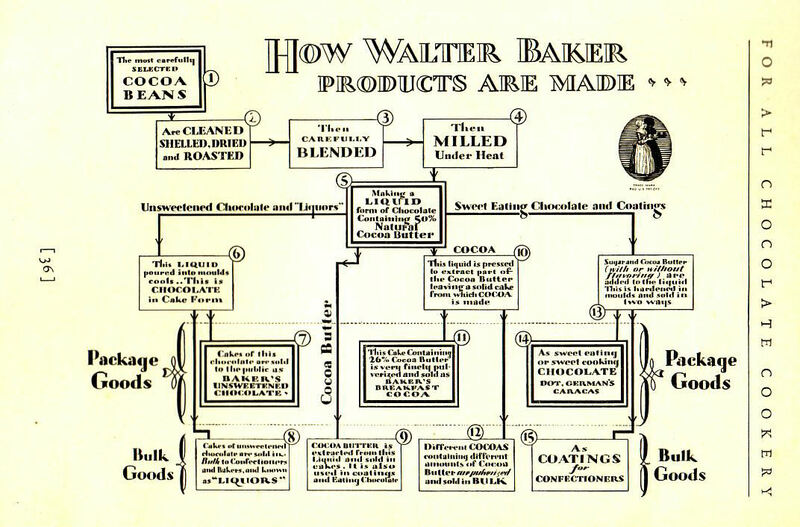 This one starts off with a three-page history, “Four Centuries of Chocolate,” followed by “From Cocoa Beans to Chocolate” (there’s even a flow chart at the end – see below! ), and then pages of technical information about chocolate and how to work with it. It says the first U.S. chocolate mill was founded in Dorchester, Massachusetts, in the 1760s, which was bought by Dr. James Baker in 1780 and then inherited by Walter Baker. Baker’s chocolate is still being made today; I use it all the time. I’m tired of recipes that require molds (of which there are a lot in this one), so let’s look at its recipe for brownies! Mmm, brownies. Sift flour once, measure, add baking powder, and sift together three times. Add butter to chocolate and blend. Combine sugar and eggs; add chocolate mixture, beating thoroughly; then add flour, vanilla, and nuts. Pour into greased pan and bake in moderate oven (350 F) 35 minutes. Cut in squares before removing from pan. Makes 25 brownies. *With other types of baking powder, the proportionate amounts should be used. I really should look into the qualities of different baking powders in more detail; I suspect these recipes could go badly astray if I assume modern baking powder works the same way. And I wonder, does sifting the ingredients four times make a difference? I should give it a try some time. I suspect this currently available chicken shortcake recipe is not *far* from the original…. You’re probably right, Beth. That looks pretty “classic.” I bet I could find a recipe in one of my other pamphlets, too, if I took the time to look.